During my 40 year career in travel and tourism, the number of people crossing international borders has grown from 100 million a year to just under a billion. At the same time, I have watched distinctly different, magical and remote communities with cultures whose unique worldview had so much to teach us, be engulfed, usurped, diluted, and become endangered. As lamented in a previous post called On Homecoming and Wayfinding – Re-thinking Sustainable Tourism, present generations simply don’t know what they have been deprived of experiencing. 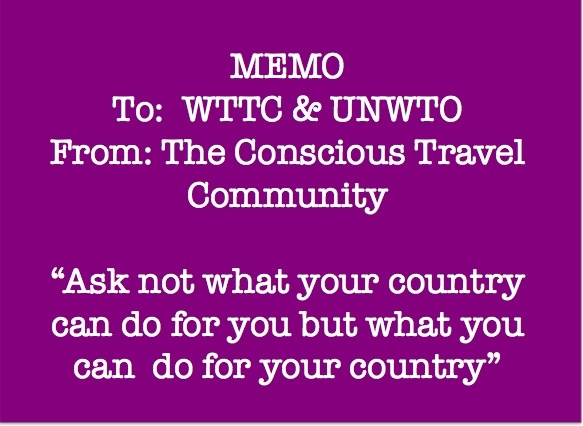 According to the UNWTO, the current volume of international trips is confidentially forecast to double over an 8 year period – in other words at rate 5 times that of the past growth I have witnessed. What alarms me is the lack of serious, considered debate as to whether such growth is possible or even desirable and what the costs of trying to meet those forecasts might be let alone the probability that they could be achieved or sustained. What does the doubling of tourism really mean? Who will benefit and who will suffer? There is no doubt that tourism has become a powerful economic and social force with both positive and negative effects. It has provided entry jobs that have enabled hundreds of thousands of people to lift themselves out of poverty and helped spread wealth from what were once called “have nots” to the “haves”. Tourism has preserved some cultures and provided an economic justification for protecting some natural landscapes but at an enormous cultural, social and environmental cost that has never really been systematically inventoried or assessed. The returns from each incremental visitor are now diminishing year by year due the very nature of how the industrialized model works. In the same way that the ocean tide is controlled by the phases of the moon, the tide of tourism is driven by forces outside the control of the receiving community. Changes in exchange rates and the economic vitality of source countries account for over 90% of tourism traffic. So when the tide comes in and volume surges more capacity is increased (more hotels are built, roads are widened, and runways extended or increased.) When the tide flows out due to external factors that can range from terrorist attacks, epidemics, natural hazards to the collapse of stock markets, then prices are discounted and suppliers attempt to fill their time-based perishable products of rooms, airline seats and restaurant covers at whatever price consider necessary to meet an internal revenue target. Tourism demand is a roller coaster and its frequent and often unpredictable boom and bust cycles can cause untold hardship experienced mostly by vulnerable workers located at the bottom of its wage pyramid. With each passing year the vitality of the sector is sapped. Consumers’ ability to make instant price comparisons increases the downward pressure on prices and converts what were once scarce, magical, mysterious retreats into commodities. Cost cutting follows. Processes and procurement are standardized and unique places lose their distinctiveness as services and places start to look the same. Automation strips the cost out of many services but deprives the traveler of human and humane care. Tourism has become a time bomb, according to Accenture’s Paul Newman and Mark Spelman in this Havard Business Review Paper of the same name. While vulnerable places like England’s Stonehenge, Ecuador’s Galapagos and Peru’s Machu Pichuu are having to limit visitation, it’s Venice that is probably the most obvious “canary in the mine”. We publicly may mourn “the death in and of Venice” – see previous post on this blog but fail to address the real problem: there is only one Venice and its capacity to absorb more and more visitors every year is limited. Venice is “under siege” by tourists and faces “irreversible” catastrophe if limits aren’t imposed on visitor numbers, warns a report released Monday by Italy’s leading heritage group. Italia Nostra (Our Italy) accused the Italian government of ” underestimating the devastating effects of past and future development projects and tourism policy,” Reuters reports. How can we as a tourism community be proud to say “we destroyed Venice?” Furthermore, if sustainability is all about acting now to provide subsequent generations with the same choices and opportunities we enjoy, then how could our actions of the past 50 years be considered even remotely sustainable. I am disappointed with the leadership shown from both governments and the private sector. The UN-related organisations send out mixed signals. They talk a good talk about sustainability – even issuing Green Passports- but get positively gleeful when volume projections bounce back to “near normal” and growth gets back on track. They talk about tourism being resilient and a force for good but continue to demand more recognition and influence. Despite the fact that their demands for recognition have been made year after year on every Tourism Day with boring monotony, they have to admit that their approach is not working. 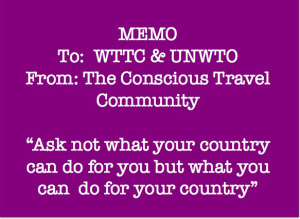 In March 2011, Taleb Rifai, Secretaru General of the UNWTO was reported saying that tourism ministers around the world lack authority. Can we Afford the Cost of More Cheap Travel? In short, we think it’s time we all woke up – which is why we are talking up Conscious Travel. To be “conscious” is the be awake, aware and alert. It means taking a fearless inventory of where we’re at, where we’re going, our strengths and our weaknesses. It means facing reality and speaking the truth. “In times of universal deceit, speaking the truth is a revolutionary act” George Orwell. So in an Orwellian sense is is a revolutionary act. But it’s not about blaming or shaming. It is about coming together and supporting one another in envisioning and then creating a viable alternative that doesn’t cost the earth. In addition to waking up, we think it’s time we grew up. Conscious Travel is about responding to the general question that JFK posed half a century ago. Until members of the tourism community – be they operators of small businesses or leaders of global associations – address that question with sincerity; unless we start to engage in the same level of debate and soul searching that virtually every other economic sector is now embracing; unless the tourism community is willing to step forward and say this is what we can do to change and how we can help make the transition, we’ll continue to be considered superfluous and trivial. Our ministers – even if we can keep them – will continue to be considered lightweight and lacking authority; and our corporate leaders will continue to whine and complain. So if any of these thoughts resonate with you – either positively or negatively – please join the conversation and make a comment. Great post Anna. I hope everyone involved in our wonderful travel and tourism industry reads this.